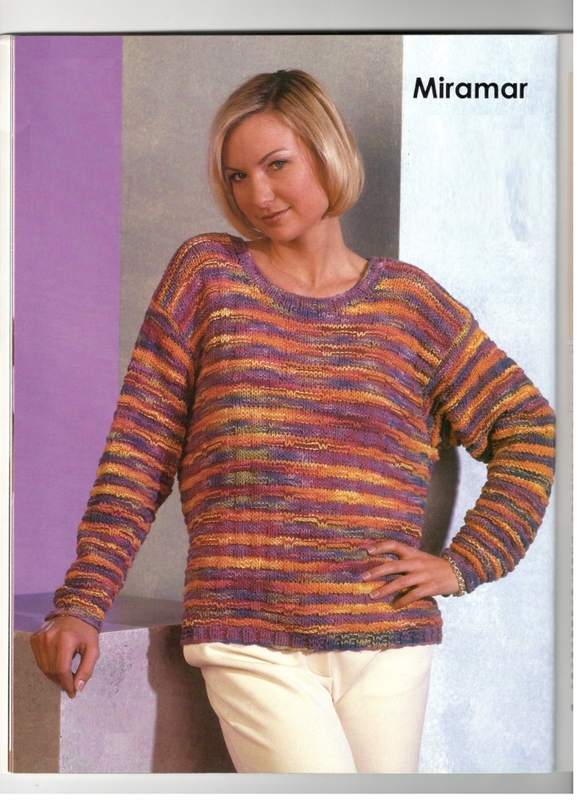 This attractive pullover is worked in a two color pattern using Wool in the Woods Dover. Circular knitting needle 16 in. long in size 7 U.S.
17 sts and 28 rows = 4 in. with Wool in the Woods DOVER and larger ndls in pat st. NOTE: When using hand-dyed yarn, remember to vary skeins throughout garment to maintain color quality. Row 1 (RS): K 2, *p 2, k 2: rep from * to end. Row 2: P 2, *k 2, p 2; rep from * to end. Rep Rows 1 & 2 for 2×2 rib. Row 1 (RS): With A, knit. Row 2: With A, p 2, *k 6, p 2; rep from * to end. Row 3: With A, k 2, *p 6, k 2; rep from * to end. 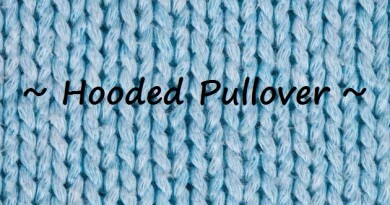 Row 4: With A, purl. Row 5: With B, knit. Row 6: With B, k 2, *k 2, p 2, k 4; rep from * to end. Row 7: With B, p 2, *p 2, k 2, p 4; rep from * to end. Row 8: With B, purl. Rep Rows 1 -8 for two-color pat. With smaller ndls and B, CO 82 (90, 98, 106) sts. Work in 2×2 rib for 6 rows. Change to larger ndls. Work in two-color pat until piece meas 12 (12 1/2, 13, 14) in. from beg, ending with a WSR. 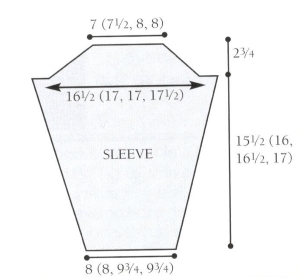 Shape armholes: Maintaining pat, BO 4 sts at beg of next 2 rows. Dec 1 st at each edge EOR 3 (4, 4, 5) times — 68 (74, 82, 88) sts. Work even in pat until piece meas 19 1/2 (20/2, 21,22 1/2) in. from beg, ending with a WSR. Shape neck: Next row (RS): Maintaining pat, work 22 (24, 27, 29) sts, place next 24 (26, 28, 30) sts on a holder, join another ball of yarn and work rem 22 (24, 27, 29) sts. Working both sides at the same time with separate balls of yarn, BO 2 sts each neck edge once — 20 (22, 25, 27) sts each side. Work even in pat until piece meas 20/2 (21 /2, 22, 23/2) in. from beg. 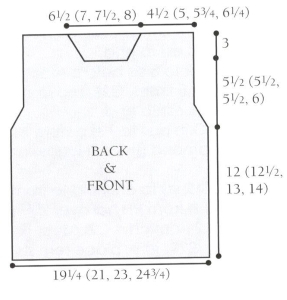 Place 20 (22, 25, 27) sts from each shoulder on separate holders. Work as for Back until piece meas 17 1/2 (18, 18 1/2, 20) in. from beg, ending with a WSR. Shape neck: Next row (RS): Maintaining pat, work 28 (30, 33, 35) sts, place next 12(14, 16, 18) sts on a holder, join another ball of yarn and work rem 28 (30, 33, 35) sts. Working both sides at the same time with separate balls of yarn, BO at each neck edge at beg of EOR: 3 sts once, then 2 sts once. Dec 1 st each neck edge EOR 3 times — 20 (22, 25, 27) sts. Work even until piece meas 20/2 (21 /2, 22, 23/2) in. from beg. Place rem 20 (22, 25, 27) sts from each shoulder on separate holders. every 6th row 11 (12, 8, 8) times — 70 (72, 74, 74) sts. Work even until Sleeve meas 15 1/2 (16, 16 1/2, 17) in. from beg, ending with a WSR. Shape cap: Maintaining pat, BO 4 sts at beg of next 2 rows. Dec 1 st each side EOR 4 times — 54 (56, 58, 58) sts. BO 4 sts at beg of next 6 rows — 30 (32, 34, 34) sts. BO rem sts loosely. 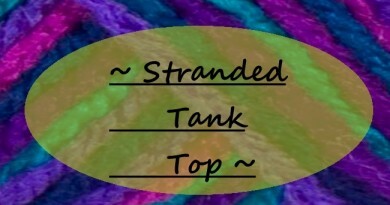 Knit Front and Back shoulders tog. Sew in Sleeves. Sew side and Sleeve seams. Neckband: With RS facing, using circular ndl and B, PU and k 21 sts from shoulder seam to Front holder, k 12 (14, 16, 18) sts from Front holder, PU and k 21 sts to shoulder seam, PU and k 5 sts to Back holder, k 24 (26, 28, 30) sts from Back holder, PU and k 5 sts to shoulder seam. Place marker and join. Work around in 2×2 rib for 6 rows. BO loosely in rib.